When I reached Stockport on the Mersey walk the other day, I took a stroll around the town and ended up in the Art Gallery on Wellington Road where a new exhibition had just opened. Street Scene: Artworks from Stockport’s Art Collection features the work of well-known artists with local connections such as L.S. Lowry, Alan Lowndes and Harry Rutherford alongside the lesser known painters. 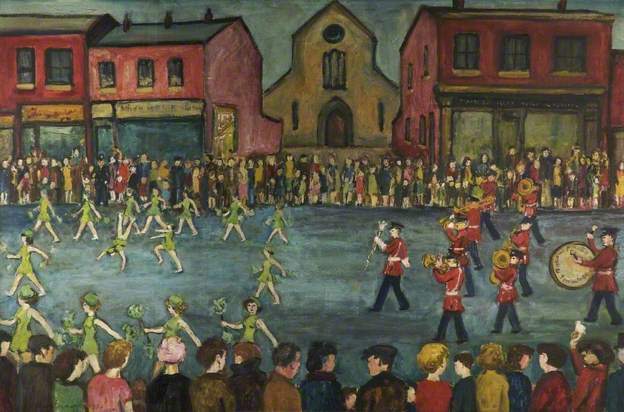 The common theme in all the works on display is that they depict life in the streets of Stockport – street parties, demonstrations, carnivals and parades. 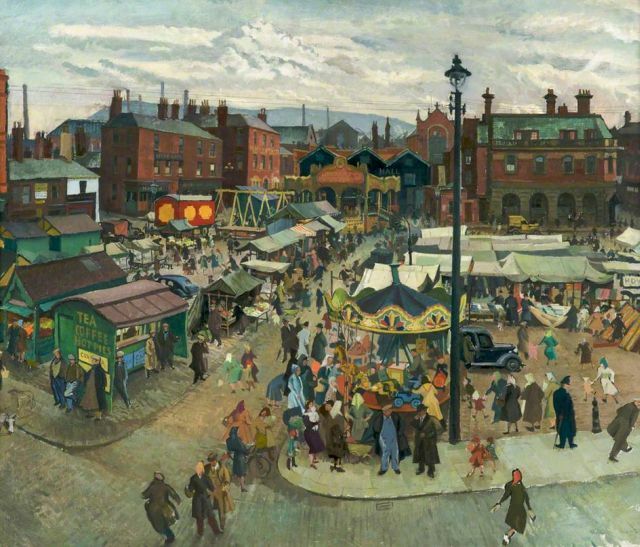 The centrepiece of the exhibition is A Street in Stockport – Crowther Street (above), painted by Lowry in 1930 and bought by the gallery in 1935 for 35 guineas. It’s been a favourite of mine since I first saw it displayed at the Lowry Centre in Salford a few years ago. It might just be the depiction of a scene by a well-known artist nearest to the place where I grew up – Poynton, ten miles to the south. What the gallery didn’t realise until they examined the painting was that they were getting two Lowrys for the price of one. Also on show is a reproduction of an unfinished painting that was discovered on the reverse of the canvas. A Crowd Scene must have been started by Lowry before his painting of Crowther Street. An intimate crowd scene, it is in quite an advanced stage, but there is no evidence as to why it was abandoned. The two faces of the painting were conserved by the North West Museums and Galleries Service in 1992. There are lighter oblong patches visible on the reverse image where labels from various exhibitions have been removed. Afterwards, I went to see Crowther Street, which survives about half a mile away, near the centre of town. 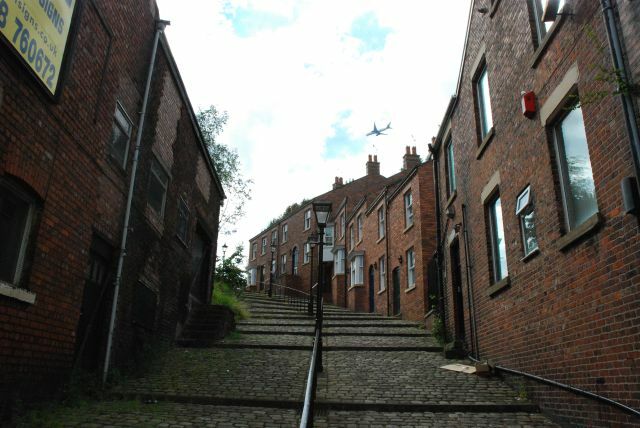 I took the photo above which reveals the artistic licence taken by Lowry in sharpening the angle of the curve of the street, and depicting the terraced houses sporting white and red washes rather than the plain brick. What is missing from the photo are the people – today Crowther Street is a quiet, half-forgotten lane lacking the bustle and animation of Lowry’s picture. There is a plane, though: every three of four minutes one follows the flight path over the town centre on the approach to Manchester airport. There was one other Lowry in the exhibition – a pencil drawing made in 1929 of Meal House Brow. It shows the view from Stockport Market Place looking down towards Underbank. This is the view of Meal House Brow today. 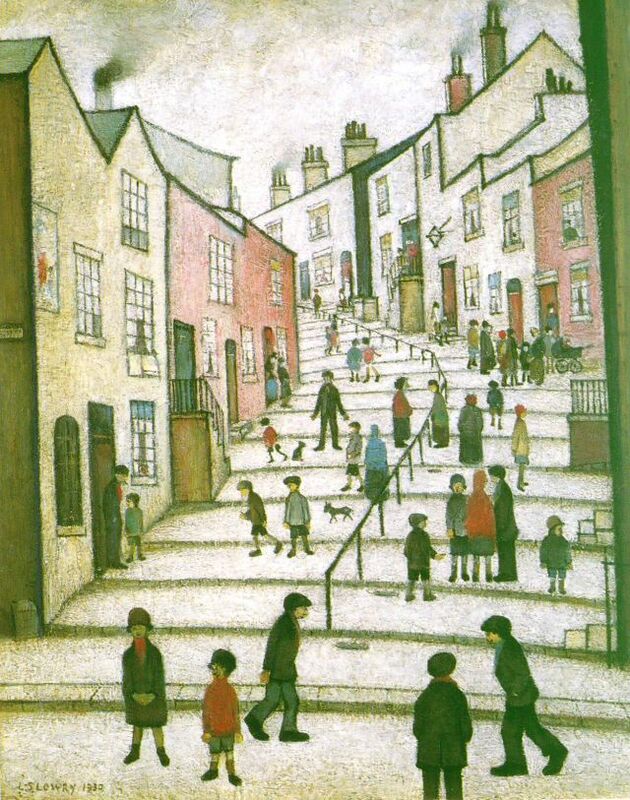 Lowry’s drawing is reminiscent of the much later one above – Old Steps, Stockport – made in 1969. 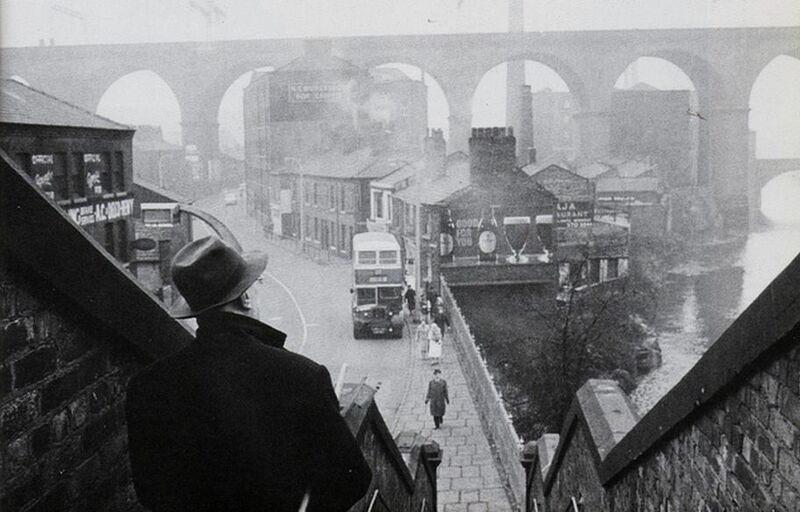 Two photos – the above and the one below – show Lowry in Stockport in 1962. Prominent in both photos is the famous railway viaduct that Lowry incorporated into many of his paintings which, although the composition might be imaginary, often incorporated elements of real places into the view. Stockport Viaduct seems to have haunted the artist. 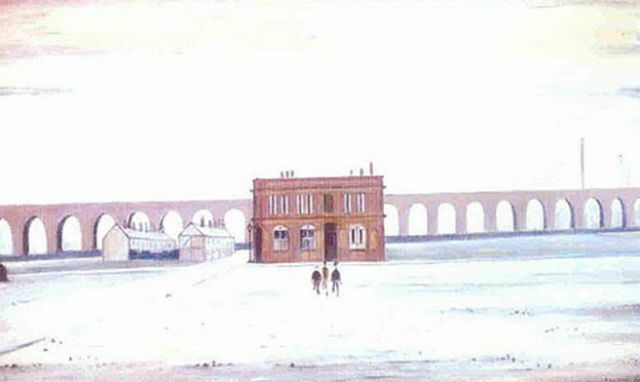 In The Viaduct (below), for example, it appears as the backdrop to a fairly desolate urban landscape containing only two rows of terraced cottages and a large pub, towards which three men are resolutely making their way. The Viaduct was once owned by Sir Alec Guinness. 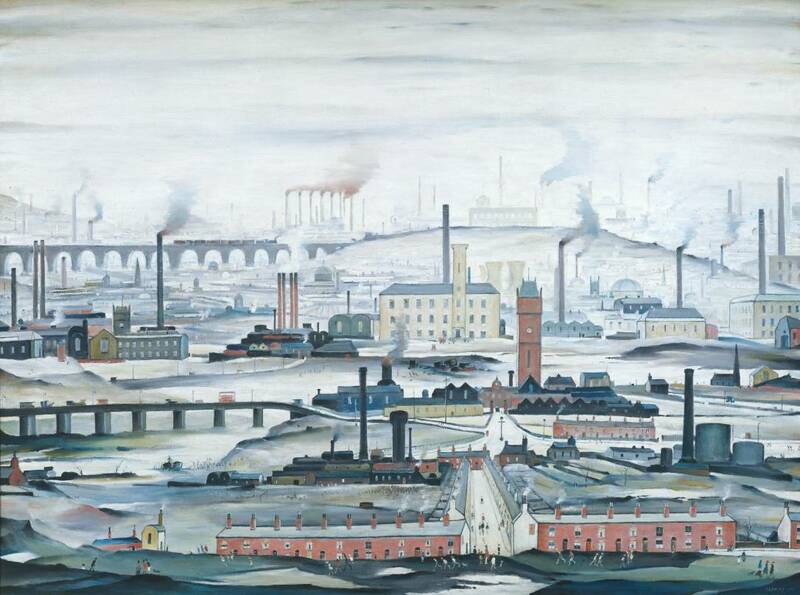 In Industrial Landscape (below), painted in 1955, the viaduct can be seen in the middle left of the picture. But on the whole the image presents a generalised impression of an urban environment, dominated by smoking chimneys, factories, roads, bridges and industrial wasteland. These features seem to overwhelm the human presence in the scene, limited to tiny figures in the foreground going about their business in a terraced street and on wasteland. 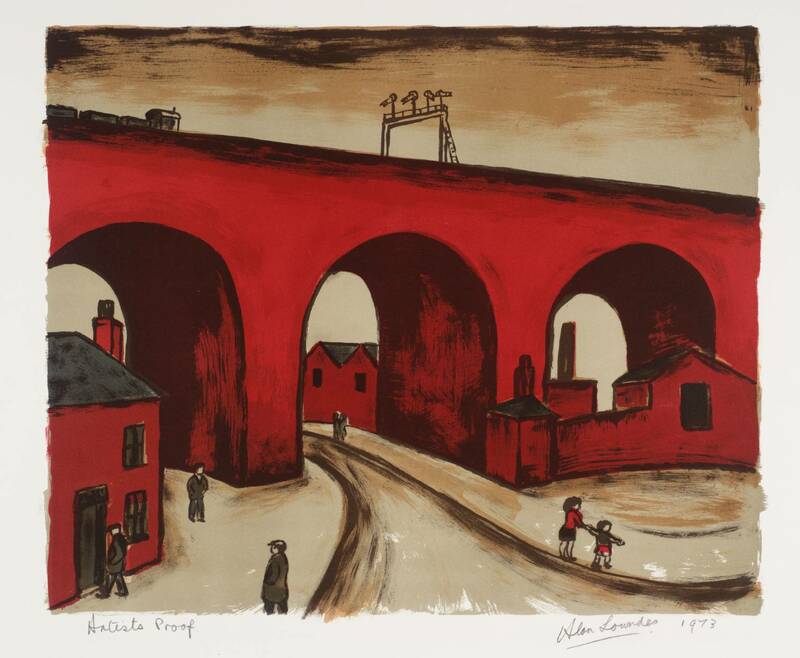 The title of Stockport Viaduct (1958, below) might suggest a realistic depiction, but again the scene is an imaginary composite. 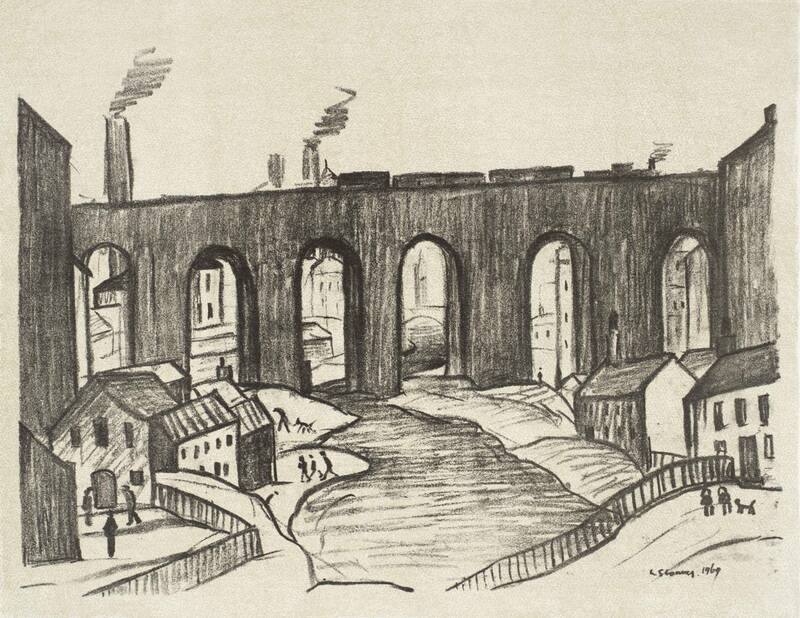 Again, in the 1969 drawing below, The Viaduct Stockport, Lowry has neither realistically portrayed the details of the scene, nor accurately rendered the viaduct’s proportions. 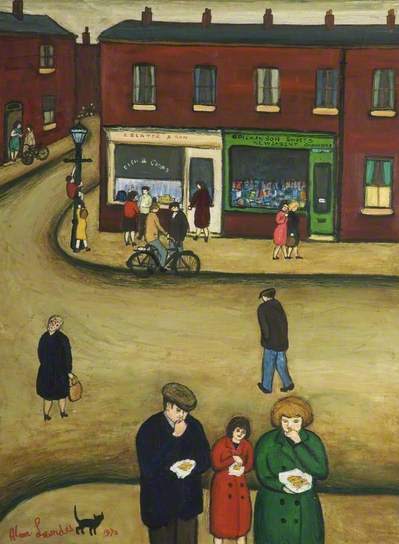 Alan Lowndes, who has two paintings in this exhibition – Stockport Street Scene and Love Lane Corner, both seen below – was a local artist who painted many scenes in and around Stockport, including the view of Stockport Viaduct in 1973, also below. Born in 1921 in Heaton Norris a, suburb of Stockport, Lowndes was the son of a railway clerk. He left school at 14, and was apprenticed to a decorator. After serving in the Second World War, he studied painting at night school, but was largely self-taught. He began to achieve success with his scenes of northern life in the late 1950s and early 1960s, just at the time when interest in northern culture was at its height. 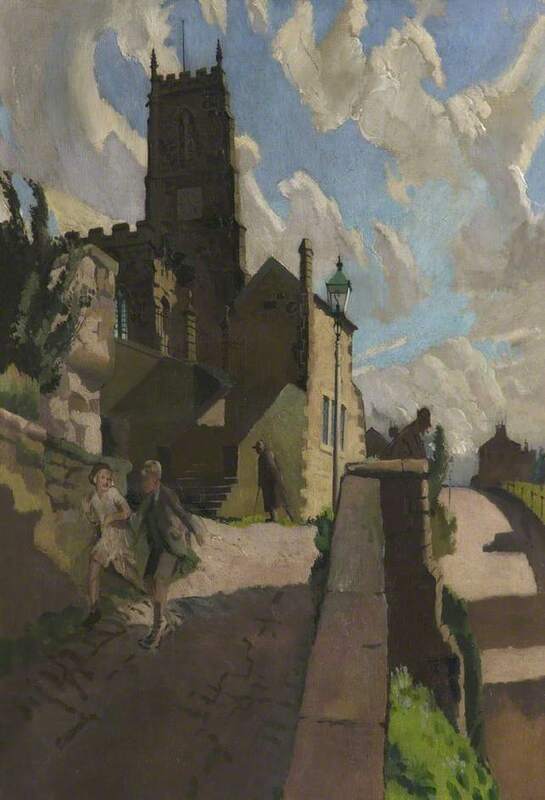 Harry Rutherford, whose September, Mottram (below) is on show in the exhibition was born in the Stockport suburb of Denton in 1903, the youngest of four sons of a hat trimmer. The manufacture of hats was one of Stockport’s main industries (gone now, but the town still has a Hat Museum), based in the town centre and in nearby Hyde, and it was to Hyde that the family moved in 1905. Today there is Blue Plaques to Harry Rutherford at 17 Nelson Street where he lived. While he was still at school Harry attended Saturday morning classes at the Hyde School of Art. He left school at fourteen but continued to develop his skills through evening classes at the Manchester School of Art, where he met L.S. Lowry who was attending the same classes. In 1925 Walter Sickert came to Manchester to open an art school at the invitation of a local art dealer. The class had places for thirty pupils, and Harry was both the first and youngest to enrol. Rutherford and Sickert became firm friends and Sickert’s influence on Rutherford’s technique was very strong. 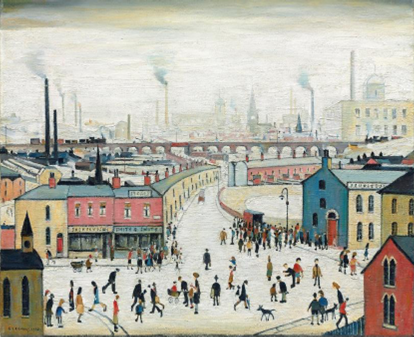 Harry’s painting Saturday Afternoon, now called Northern Saturday (below), depicting Hyde town centre, is arguably his most famous. It was acquired by Hyde Corporation in 1948. Tameside Council has a web page with information about Rutherford here. More paintings by Harry Rutherford can be seen on the BBC Your Paintings website here. The houses in present-day Crowther St are, of course, not the ones Lowry painted. They are comparatively recent – built in a sort of ‘heritage’ version of Stockport housing. I remember Crowther St when I was much younger, the houses empty, derelict, then demolished. Great posting – as is your report of the walk through Woodbank Park. I didn’t realise that, Michael. I only stood at the end of the street and must admit I didn’t look too closely at the houses. Did the old houses have a wash over the brickwork? I’m almost certain that the original Crowther Street houses were plain brick. Could be wrong of course – happens more often than I’m comfortable with! Absolutely loved this post, love the blog and its entire concept. 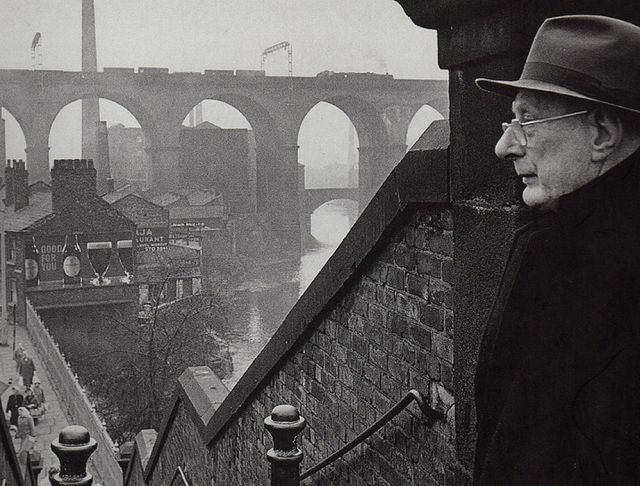 Great pic of old Stockport starts it off with old J S himself. Have lived in Stockport suburbs since 1978 and know the town well. In that view only the steps down and river remain this side of the viaduct. Mill still there but derelict and all chimneys gone. Didnt even know about Crowther St so must go see it. Will be following this highly interesting blog til the end of the journey – you treally should turn this into a book! Congrats! Thanks, lad, for those kind words. I’m glad you find interesting reading here. The next instalment of the Mersey walk has been walked – it just remains to write it up! Look forward to seeing it. Know parts of the next section of the Mersey well. Where the pyramid mow stands plus the BMW garage et all and further downriver used to be site of one of Stockports main tips circa 1880-1900. There was also once a mill down the river there. Also once down there at the end was a large old steam loco shed known as Heaton Mersey Gowhole. It was actually built on top of said tip! As you go further downstream near Didsbury you come to a ford which was known as Royal Ford as apparently some royalty crossed it. Believe its now known as Heaton Mersey Weir and its probably very different to when I was last there in the mid 1970s. Nearby used to be an old bleach works which once had a huge chimney. Keep up the good work, I look forward to following your progress. Love this post. Particularly love the photos! Do you know if it is possible to buy prints of them anywhere? Thank you, Nadine. When I used the photos in my post I didn’t really ask myself who took them. A little bit of Internet research and I’ve found out that they were taken by Crispin Eurich. He was the son of a painter and initially he intended to follow in his father’s footsteps, so began training at Southampton Art College. But after winning first prize in a 1950s Photokina competition, he changed direction. This website says that collections of postcards and books with photo-illustrations by Crispin Eurich are available at “The First” Gallery, Southampton, and by mail order. (http://bit.ly/OitN2n) The First Gallery, 1 Burnham Chase, Bitterne, Southampton SO18 5DG Tel. 023 80 462723 email Margery@TheFirstGallery.com Good luck! I enjoyed this. I’ve often thought of doing a similar journey myself. I even asked The Lowry gallery about the drawing of those old steps, and they weren’t sure where it was. I can see why you were drawn to those steps near the market, especially with the street lamp. 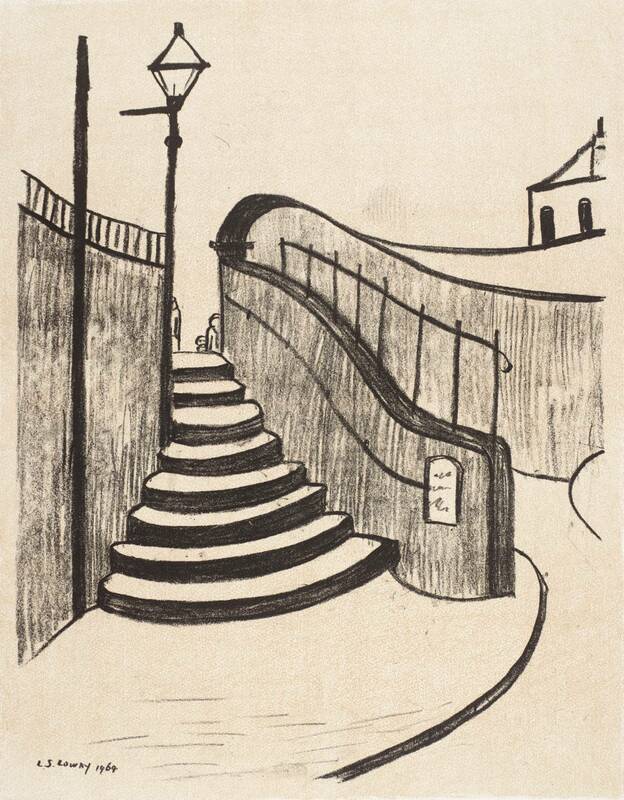 However the more I think about it, I’m sure the actual steps either don’t exist any more, or Lowry’s drawing was a composite, or fictitious steps that were similar to Meal House Brow. It’s interesting to document local buildings and views, because places do change over the years. I think Lowry had an eye for making his art. He painted things people usually see on an everyday basis/pass everyday without thinking much about it. I think you’re right – Lowry’s drawings and paintings were often composites or re-imaginings of real places. I’ve always wished those steps really existed though. Anyhow I think you found the nearest to it though. Thanks for introducing me to gems from new (to me) Stockport artists. Also for reminding me of my childhood in 1950s south Manchester and visits to the UCP tripe shop and the cheese hall in Stockport. Proud to recall my Uncle Leslie’s (Suggett) achievement in the early sixties in persuading the council of Swinton and Pendlebury to purchase some bold charcoal/soft pencil, early Lowry drawings and later help give him the freedom of Salford. Also to recall Ian Downes, fellow pupil at Cheadle Hulme School talk of visits by Lowry to his parents house in Cheshire for Sunday lunch. Thanks for an interesting comment, Chris. The UCP tripe shop! I bet that’s gone now! Thanks for that, Jenny. I sense your family have moved far away from south Manchester! Solomon sounds like he might have been an interesting guy. There is a hat museum in Stockport, though I’ve never been. Noted your providing our contact-details in your reply, and thank you for it, but strictly speaking we only allow our images to be reproduced under controlled conditions. Margery [as in margery@the first…] is the other part of “The First” Gallery, but I deal with Crispin Eurich’s archive (Paul CrispinEurich com). We don’t, and can’t, police the entire Net and ban the free use of this iconic image, but we do ask that you edit your pages and add our (c)-notice and contact-details as a caption under each image, not buried in your posts and replies. Please tell us where you sourced these copies. Thank you. If you have copy of “Lowry Himself” , our contact-details are in there, but other publications, some from reputable publishing-houses, have published without seeking permission, so I can’t blame you individually. But (c)-fees and print-sales are our only source of funding, to keep Crispin Eurich’s name in front of the public, so links like I’m asking for here, are part of that. 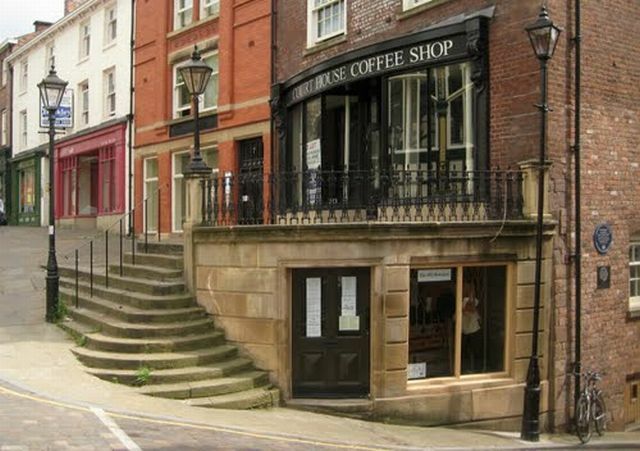 On another thread: somewhere in the Lowry literature (can’t recall the exact source) is a comparison with his Crowther Street Steps and the original view. Although these houses have been rebuilt, he did make subtle alterations from the properties he would have seen in the flesh. I’m sure the article shows a contemporary photograph. Can’t see why folks express surprise at him ‘mucking about’ with all this imagery: he was an ARTIST, for God’s sake!! Paul, I’m sorry to have stepped over the line on this. I must say, as an ordinary joe in the age of google image search it’s bewildering to know what is restricted and what is just in general circulation. However, if you’re happy for the two images to remain on this post I will certainly add your details to the caption (I’ve done it). They are both low-resolution and no-one could get a decent print off them I would think. I found both photographs by doing a Google image search. The one of ‘Lowry standing at the top of the Wellington Bridge steps’ (where he’s looking left) I found here: http://www.lowry.co.uk/lowry-stockportviaductphoto.html (it’s also on this Pinterest board: http://www.pinterest.com/yearscomeandgo/ls-lowry/). The other one I found here: http://www.focsle.org.uk/first/crispin/index.htm. That’s fine. Don’t feel bad about it, and I agree about the confusion. Sites themselves (like flickr, yahoo, tumblr, etc. and [probably Pinterest) automatically add the “fact” that images posted are Creative Commons, which they are only if they’re not copyrighted. They auto-add this to protect themselves, but of course it can misinform other viewers. Thanks for the amendment. I’ll follow up those other sites. Ref. “Stockport Viaduct” title on Lowry painting. He rarely applied titles. Usually his dealer did it. I came across your very informative and helpful blog when researching for Making Headway, a 2014 Arts Council project at the National Hat Museum, Hat Works, at Stockport, and having visited Stockport recently, to research the couture hat collection I will create in due course, for Making Headway, very pertinent. Following my recent visit I find the iconic images of Stockport by Lowery and other notable local artists that you have posted here very helpful, as well as the background information contained in your blog. In due course the collection I create will be exhibited at the Hat Museum, and images posted on my website http://www.margaretwoodliffwright.com. Do you have any idea where I could find this? I’m really struggling!